Amazing renditions of 1920's and 30's jazz and popular songs, as well as vintage sounding original numbers, performed with aplomb by this sizzlin' sextet from Portland, Oregon, USA. 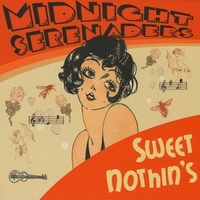 The Midnight Serenaders are back with a follow-up to their very popular debut 2007 release "Magnolia" with this new collection of 1920's and 30's influenced jazz and pop songs. This recording features four original songs penned by singer/ukulele player Dee Settlemier. Riding the crest of the neo-traditional jazz craze presently occurring on the West Coast, the MIDNIGHT SERENADERS are a six-piece swing band playing regularly to enthusiastic audiences throughout the Pacific Northwest. Performing vintage pop, Hot Jazz, and Hawaiian instrumentals, as well as an expanding collection of Jazz Age-sounding original songs, these six veteran musicians strive to share their love for the music of the 1920’s, 30’s and 40’s. With an exciting stage show, tight musical arrangements, and outstanding solo and harmony vocals, MIDNIGHT SERENADERS fans include nostalgists, swing dancers, melody junkies, retro-clothing hounds, and folks who simply appreciate good quality, jubilant music. "Young, Mad & Swell: Midnight Serenader’s Sweet Nothin’s"
There is magic afoot for The Midnight Serenaders second album. Sweet Nothin’s manages to avoid the sophomore slump and retain all the things which made their first album special without merely falling back upon a specific, now proven formula. The personnel is the same sextet from their first album and their familiarity with each other allows for not only an effortless interplay but a certain degree of playful virtuosity which causes this studio recording to give off the excitement of a live date. The Serenaders have always been a sort of musical era hub, embracing hot jazz, country swing and early Americana before genres became static in regards to what made up each of them. Listening to them play, one immediately picks up on an authenticity of execution which also manages to maintain an organicness, aural echoes of a sort; as Tin Pan Alley scribes sit drinking diner coffee with Gotham nighthawks while Fats Waller tinkers away in the background on an old upright. While the components and roots from which The Serenaders draw their inspiration remains the same, they keep it interesting by varying the degrees from song to song in how much of each genre they draw from, the naissance of the big band era pedigree being the commonality. The album is made up of (mostly) early big band standards and originals penned by The Serenader’s Dee Settlemier. The album opens with a Fat’s Waller tune “I’m Crazy ‘Bout My Baby”. This version leans more towards a country swing feel. It is a good opening shot as it shows off the excellent sound quality which occurs throughout the entire album. The initial vocals are by Doug Sammons. Both he and Dee understand how this type of music should be sung and their inherent knowledge is further helped by the fact that they are both technically good singers. The sort of talk-singing and cartoon voice affectations which sometimes pop up in (older) era specific music are always absent from their deliveries. The instrumental line up of the ensemble is akin to what one would have heard in the hey day of hot jazz playing in a speak easy or gin joint or perhaps blossoming out of a Victrola’s tin tulip as a flapper dances by herself; getting ready for a night out on the town. The entire band has knowledge and feeling for the pedigree of the music they play and there is never a solo which sounds as if it is a chronological abnormality. Multi instrumentalist David Evans here is heard on clarinet whose happy calls and runs are buoyed by the strumming of guitar and ukulele. The clarinet’s tone has a rich woody sound which is contrasted by clean fat sounding notes of Garner Pruit’s trumpet. Towards the song’s end the trumpet’s statements are peppered with interjections from Henry Bogdan’s Hawaiian steel. When Dee’s voice first enters the song it is given a sort of tube old time radio cadence. When Doug and Dee, now in her regular singing voice duet it subtly underlines that the song as done by this ensemble is about aural contrasts which work to sonically to enhance each other: Clarinet to trumpet, trumpet to lap steel and Dee to Doug. “Sweet Nothin’s” is an original by Dee. It is sassy ode to desire and features some clever word play as was the stock of bygone era’s lyricist. The band’s affection and knowledge of early American music is further illustrated by the fact that none of the originals sound like pale comparisons of what had inspired the ensemble. All the originals heard here could easily have come from West 28th Street between Fifth and Sixth Avenue (NYC). The first solo is from the lap steel. As played by Henry Bogdan it is not limited to one type of approach whether making a solo statement or playing ensemble. There is a diversity for this now obscure to popular musical instrument which is taken full advantage of here. The trumpet here underpinned by clarinet, has a more raucous tone conjuring up shades of Storyville and contrasting nicely with the ‘steel solo. The album stands up to repeated listenings. One factor for this is that not everybody has to solo on every song and the order in which solos occur, come and go within a piece, occurs differently from song to song. Pete Lampe on upright bass has a tough job in that it takes restraint which is here equated to a subtle tastefulness in regards to his solos. A lot of the music which the Serenaders draw their inspiration from did not have too much flash in regards to what a bassist could show. The magic of hearing music from another time seemingly alive and just birthed could be broken by too long or too flashy a statement from the bass. His steady low end tone provides support and adds to the fullness of each pieces sound. This aspect of his playing becomes even more important when one considers there is no drummer or piano in the band. In “How’d Ya Do” there is a meditative bass break which takes place over the other strummed instruments before the trumpet comes in, its mood set by what had come before it and seamlessly facilitating a like minded mood from tenor saxophone. “How’d Ya Do” by Jerry Byrd (1920-2005) as done by The Serenaders sounds like a sibling of Django Reinhardt’s (1910-1953) “Nuages”, possessing a free flowing dreamy aspect. Despite being written decades later than the rest of the cover material on the album there is a perfect logic to its inclusion both in style and pedigree. Jerry Byrd was affiliated with the Grand Ole Opry and later in life he worked hard to promote steel guitar and Hawaiian music. He was also the first inductee into the Steel Guitar Hall of Fame (1978). The early days of jazz saw a lot of the top great first soloists performing seemingly “fluff” pieces. While Bix Beiderbecke (1903-1931), Fats Waller (1904-1943) and many others had a number of novelty tunes in their books they more often than not still managed to create some memorable moments within these songs in their solo statements. During this time in Jazz’s history too, there was far more of an enmeshing of populist entertainment elements and (sonic) art. One of my favorite tracks is “Diga Diga Do” by the Mills Brother (1932). It begins with a buoyant bass pattern and a gospel tinged vocal. The song does not lean as much towards the novelty side of its aspect as has become the norm for a performance of it. It is still fun though, reiterating the initial spirit of the piece but allowing the solos show some of what the hot in hot jazz was all about. There is muted trumpet and tenor saxophone bar walking solos as the rest of the band seems to happily race towards the finish. The first album had a Billy Holiday (1915-1959) cover which stylistically was so different from its typical performance that it managed to avoid all comparisons. Here again they make the attempt and succeed, this time with “Comes Love” (1957). The vocals are traded off initially and then shared; a lament for the inevitability of romance’s power. The solos by trumpet and saxophone have an almost bluesy klezmer feel to them. The album is a little under an hour long. The packaging has vintage looking graphics inside and out with no liner notes. Although all music needs label just as a descriptive point of reference, it would be a mistake to consider this band to be merely a nostalgia act steeped in vintage trappings. Aside from being passionate about the music, there is an adeptness in execution which means the album will get more than one or two listens before winding up in the closet or on one of the higher unreachable shelves of one’s music collection. It is a rare and great thing too to have such a sense of fun combine with art. Lovely, fresh renditions of familiar tunes and superbly crafted, quirky, super fun originals- makes my feet wander from their straight path, my heart lighten, and my smile come unbidden. A gem of a record. I LOVE you guys! Happy music, incredible musicians! Awesome vocals! Takes me to another time and place when I need an escape! Keep cranking out the tunes! You have fans for life! Excellent! I play it often. I enjoyed seeing the group on OPB. Thanks!